Simon Holloway has sent several photos from the lives of Wilfred and Evelyn Chapple of Walnut Tree Road, Brentford. 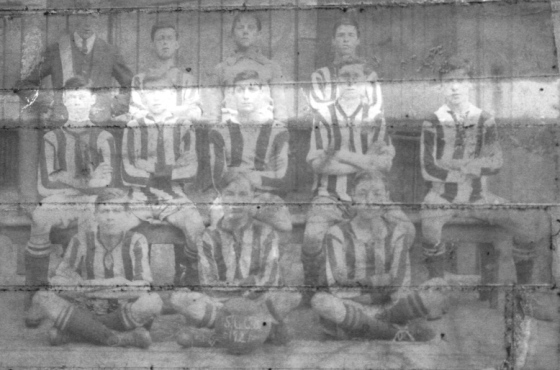 This shows a boys football team, including Wilfred Chapple, back row on the right. Simon adds 'I think I can make out '1921 St G.C.B' on the football'. We concluded this could be St George's County Boys or St George's Church Boys: there is a photo on the site showing an adult team: St Lawrence's. The photo shows 11 teenagers (late teens) and an adult. The shirts are possibly black and white vertical stripes, socks have a couple of stripes. If you can help fill in any names the please get in touch.